(AKA Indigo Blue Berries) This is a new, small cherry variety from Brad Gates, Wild Boar Farms. I call it a "novelty" tomato. Our TomatoFest seeds produce sprawling plants that yield big quantities of 1/2", dark purple color (dark enough to call it "black") indicating that it is rich in anthocyanins. 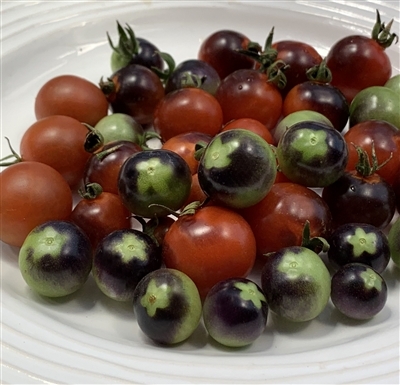 When fully ripe these tomatoes turn red where the fruit was shaded; and purple/black where the fruit has received the most sunshine. I've seen other reports stating that the fruit is luscious, sweet and flavorful. However, my experience is that the fruit of this variety is acidic and tart. Its bitterness masks the sweetness. Indeed, the purple/black clusters are beautiful to look at on the vine or in the bowl.